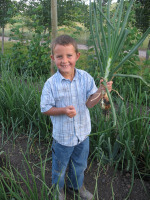 Growing onions is easy, and onions do well in a variety of conditions. 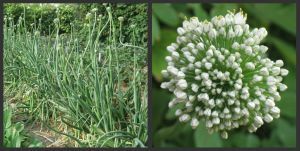 Growing onions is easy, and onions do well in a variety of conditions. They are in the same family as garlic and have many of the same growth requirements. It’s a good thing to learn how to grow onions because they have valuable medicinal properties that are similar to garlic. Onions require a long growing season. They need to mature by the beginning of August so that they’re ready to be harvested. This gives them enough time to dry out before they’re stored. 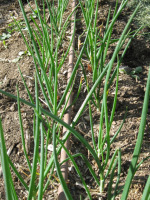 Onions can be started by planting seeds, small plants, or bulbs. The little plants have a head start in the early spring. The plants that come from seeds or plant seedlings will develop into larger onions than those that come from onion bulbs. Note: The larger the bulb you plant the smaller your mature onion will be. I know this doesn’t logically make sense, but it’s true. 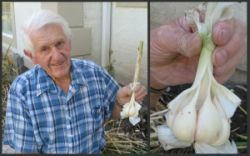 If you’re growing onions from seed, you should start them inside about 2 months before you want to transplant them into your garden (in Utah that’s about the end of January). See starting seeds indoors. Plant the seeds about 1/4 to 3/8 of an inch deep and keep them moist while they’re germinating. When the stems are about 1/4 to 1/2 the size of a pencil they’ll be ready to transplant into the garden. You can choose the varieties that meet your family’s needs. 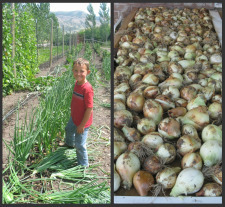 We grow the Walla Walla Onions for summer eating, canning, and early fall eating (these are a nice sweet variety, but they don’t store well). We grow the Yellow Spanish Onions because they store well. We also like some of the Red Onions for salads, etc. The Bunching Onions are good for early spring salads. One way to optimize the space in your garden is to plant the lettuce next to the onions. The onions won't start getting big until lettuce season is over. When the weather starts getting hot and the lettuce starts getting a bitter taste, pull out the lettuce. This leaves room for the onions to get big. 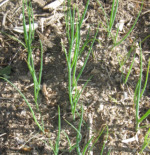 The onion seeds, seedlings, or bulbs can be planted early in the spring. They are quite cold hardy and will withstand the early spring frost. See Vegetable Planting Guide. By planting them early it will give them time to develop into a big onion prior to harvesting them in August. Prepare the row of soil in much the same way as you’d prepare the soil for peppers, tomatoes, cabbage, carrots, etc. You do this by adding manure, 16-16-16, and elemental sulfur into the soil. Rototill the fertilizer into the row. Rake the soil back and make a flat row about 16 inches wide. See Soil Preparation for complete details. 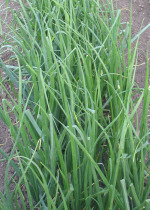 Growing onions respond well to extra amounts of nitrogen. 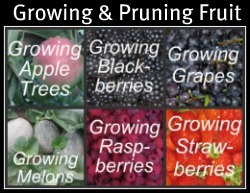 You can add this at the time of planting and/or every month during the growing season. It works well to plant a double row of onions that are about 6 inches apart. Plant the onion plants about 2-3 inches apart in the row. 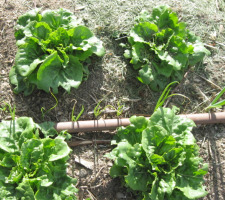 Run one drip line between the two rows, and water both rows at the same time. 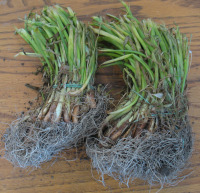 Be sure you keep the little growing onions moist until they get a good root system established. If you’re planting a lot of onions you can plant a triple or quadruple row. In addition to helping with the watering, this helps to support the growing onions from falling over. It also saves space in your garden. Run a drip line between each row. Keep them watered every week - more often during the hot summer months. See Garden Watering Systems. Keep any weeds from growing around your onions. See Garden Weeds. Our onions usually grow 4-5 inches in diameter. In the mountain west area, a rule of thumb is “Never let the onions see the August sun”. In other words harvest your onions the first part of August. The first thing we do is to step on the growing onions and bend them over for a day or two. This stops the growth of the onion and starts the drying process. Pull them out and cut off the tops leaving about a 1-inch stem. These bulbs should be placed in an area where the air can dry them out. Do not put them in the direct sun. We have found by sad experience that pulling the bulbs out of the ground and leaving them in the direct sun causes an area on top of the onion to begin to spoil. We leave our onions to dry on the back porch from the first part of August until frost time. There may be a few plants that will go to seed. If the onions go to seed their first year, they will not produce good seed. During the winter, store a few onions in a dark, cool, dry area. 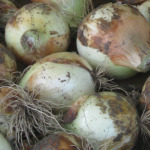 To grow your own onion seeds, you need to plant a mature onion from last year's crop. This mature onion will go to seed and produce good seed. Onions need to be stored in a place that is cool and dry. You can put them in open mesh bags or old pantyhose. The idea is that you want air to be able to circulate around the onions. Hang the bags in a place where they won’t freeze (our garage works well for us). 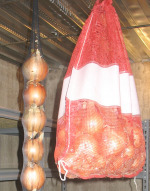 When stored properly the Yellow Spanish Onions keep all winter long with little spoilage. In the early spring when the onions want to start growing again, you can chop up the onions and freeze them. Use these frozen onions until the new crop starts producing. We rarely have to go to the store to buy onions.